It’s tough to start a new website from scratch with no traffic, in fact the whole process of drive traffic to a new websites generally can be terrifying. Traffic would hardly just appear because you launch your new site. You have to hustle for traffic and by that, I mean you need to get the word about your new website out there to anyone willing to listen. Traffic is the biggest challenge that every blogger and site owner faces. It makes the difference between success and failure of any content online. So for what it’s worth, it’s important to learn how to generate traffic when you need it. In this post, I’m going to share some tried‐and‐tested strategies you can use to drive traffic to your new website, why you should care about them and how to drive organic traffic to your website, Plus, you will not spend a dime on any of the traffic methods. How to drive traffic to your website using social media? So What’s the Right Social Media Channel for your new website? Optimize Your Content for Long-Tail Keywords. What are the benefits Guest posting? It’s important to note that these methods can be used for almost any niche or content type. Some of the methods will work better for you (and your audience) than others. If you keep working on those that work best for your website overtime, sooner than later you’ll notice that 80% of the traffic you receive will be as a course of just 20% of the efforts you put in. let’s Now look at some free ways to drive traffic to your new website for free. Quora is popularly known as a question-and-answer site, where questions are asked, answered, edited, and organized by the members using the platform. Hare is how Quora basically operates, People having question all over the world on whatever topic heads over to Quora and asks the question and experts on those topic will chip in by giving answers to the questions. As a website owner you are an expert in your niche so this is a great opportunity to make others get to know you and your website. Quora pages rank very well in Google. So as you keep answering questions on Quora your answer will continue to draw traffic from Google ranking. Presently Quora has more than 100 million unique monthly visitors. You can reach 100 if not thousands of potential targeted traffic with a single answer through Quora”subscribe to questions” feature. (Whenever you answers a question that many people have subscribe to (which is not uncommon for many people to subscribe to a popular question) all the subscribers gets a notification Email). We all know most social sites are working every day trying to make their platforms based on communities and groups. The simple reason for that is to keep people interacting within their platforms. Well Reddit is one of those sites that was built from scratch around the idea of communities and that can be a major source of traffic. Look at Reddit as a massive, high-tech message board. It’s all about sharing the same things you share on social sites. You can share images, videos, questions you name it, but on Reddit you can only do that in targeted niche communities. The only problem with Reddit if you’ve never used it before is, It’s intimidating but it has a reputation for having dedicated users and a load of traffic that anyone can tap in to. According to Alexa, Reddit has about 51 million unique users and over 1 million communities. Reddit is one of the top 100 websites on the web and it’s a potential goldmine of traffic – (but it’s vital to play by the rules! There are many, many communities on Reddit called Sub-Reddits). If a niche exists, you can be sure there’s a subreddit for it. Forums actually looks and feels a little “old school but in fact most of them are extremely helpful when it comes to driving traffic to your new website or existing one. Some Threads on some forums depending on the niche can boast up to a thousands of active users and there are forums for about any niche out there. Forums are friendly, interactive discussion areas where members can ask, share their opinions, advice and experiences on a topics of mutual interest. Like I already mentioned above, the number of active users per forum will depend on the niche and how people are engaged on the forum. An engaging niche forum on weight loss for example will have millions of active users because of the popularity of that topic online. Now you have to understand every forum has its own set of rules, and you’re expected to follow them. Some forums can ban users for doing any promotion or simply posting a link. Others forums do allow you to post links as your signature under every post you make on the platform (of course you can set that automatically in most cases). There are also some forums that don’t even care where you put your link. The truth is sometimes you can play by all the rules of a given forum and still get banned. There’s really no way to guarantee fair treatment on any platform that you don’t control. So to play it save try to be a be a good community member. The bottom line is to keep posting content that solves problems or gives readers the information they are looking for. Now I want you to pay attention here, slideshare is a platform where you Share what you know and love through presentations, infographics, documents and more. Which is a great opportunity to recycle your website or blog content to a presentations, infographics, documents. 80 million professionals trust SlideShare to learn about any topic quickly from subject matter experts. With over 40 categories and 18 million uploads you can be sure to find a category in your niche. This is the one that will blow your mind when it comes to traffic to your website if done correctly. There is no need explaining what youtube is because at one point you must have watched a youtube video. YouTube is now the World’s second largest search engine. That means many people are using Youtube to search for information like they do using the Google search bar. Unlike the other social sites, YouTube can skyrocket your traffic and views within the moment of uploading. Did you know Facebook and LinkedIn recently reduced their platform native outreach? It’s really difficult now for content owners to use these platforms to consistently drive significant website traffic. That’s simply because they are all about fostering communities and relationships, while showing users more of the content they want to see. ( New algorithms on these platform lowered the reach of most Pages but gave Groups postings more priority). As a result or consequence of all that Groups within these platforms are like Gold mines when it comes to drive organic traffic to your website. LinkedIn Groups are private forums where LinkedIn users discuss specialised topics. They are a great place for sharing ideas, meeting potential clients/customers and connecting with the biggest influencers. More than 1.4 billion of Facebook’s 2.2 billion monthly active users check groups every month. But only 200 million users are in what Facebook founder Mark Zuckerberg calls “meaningful groups.” In the near future Zuckerberg expects that number to rise to one billion. Check out the number of members a single group has after making a search with the phrase “social media”. Apart from the number of active members in the Groups, Linkedin Groups will also help expand your websites organic reach and enhance your website credibility in the process. Facebook and Linkedin isn’t the only top source of social traffic. There are definitely different social media platform that can equally drive traffic to your website. Even if social media won’t directly help your organic search rankings, posting engaging content can attract lots of traffic, shares, likes, and comments. All of which will help you increase your reach, visibility, and linking potential online. It’s really not worth it trying to be on every social media site because you will be spreading yourself thin. With too much to do you can easily slide in to spamming and as you know spamming is a NO No on social sites. Thats why its important for you to know which platform is suitable for your website interest. To find out answers to those questions, you will need to research the demographics of the main social media channels. You can then choose the channels that are best suited to your target audience’s demographics, interests and online behavior. If your Website is focused on Business to Consumer (B2C), then Instagram, Twitter, and Facebook are perfectly suitable for you because that’s these platforms offer. All three platforms offer a rich variety of communication methods, messages, comments, and like buttons that all play a role in linking online businesses to Customers. If you’re Business to Business (B2B) oriented Linkedin and SlideShare will help expose your business’s, it’s features and goals. Get this four out of five LinkedIn members are involved in business decisions world wide, Linkedin audience have a high buying power which makes it suitable for (B2B). If you have a visual product or offer services that have to do with visual planning, then Pinterest ist for you.Pinterest has visual effect and if your website has to do with images then it will be wise to optimize the images for sharing and ranking on the search results. All the different ways to drive traffic to your new website shared above were all about generating “manual traffic”.Manual Traffic is the type of traffic that you have to consistently work for to keep it flowing to your website. If you stop posting or interacting on any of the platforms above the traffic will stop flowing to your website. I have shown you in the videos how to literally hustle and drive your targeted traffic from the various platforms to your new website. Having your website run on manual traffic is giving yourself too much work and to be honest it puts a limit to the growth of your website. Organic Traffic on the other hand is hands-free. To start getting Organic Traffic to your website you have to understand a little about SEO. Search Engine Optimization (SEO) is the practice of increasing the quantity and quality of traffic to your website through organic searches made. When starting out with a new site it is important not to take SEO as your only source of traffic, because you can’t afford to wait for months for your first visitors to turn up through the search engines. You see indexing and ranking content on Google for example can take months, because your website is still new and doesn’t have any authority online. Google just loves sandboxing new sites that do not generate traffic after a long time. That’s why the manual Traffic generation methods above should go hand in hand with SEO. Here are a few tips you need to keep in mind when using SEO to drive traffic to your website. Due to the fact that new websites likely have low website Authority Score, targeting relevant Long Tail keywords and phrases, will be your only chance to rank on the search results. Long-tail keywords are much more specific. You can understand what people are looking for which means you will be able to make specific content that your website visitors want. Using long-tails keywords/phrases to your advantage is really not that hard as many people will make you think. Haven said that you should have a good understanding of how long tail keywords benefit your website. When it comes to organically ranking a new website on the search results, It is much easier doing it with long tail keywords than for the more commonly known keywords. Well, notice that the amount of competing sites for the long tail keyword is not even half of the amount for the generic keyword. So, the longer the phrase, the fewer the competing sites. Therefore, long-tails keywords are generally easier to rank high for on search engines. Most website owners want to target generic keywords simply because of the share amount of traffic they can get from it. The truth is instead of working so hard trying to rank number 10 on the first page of a generic keyword, ranking number 1 on the first page using a long tail keyword will with time generate even more traffic. The more Long Tail keywords you rank for, adding up the traffic from all the long-tail keywords, will actually lead to a higher amount of traffic than Trying to rank for a generic keyword. People typing in a long tail keyword phrase that you are targeting on your website, will have a higher chance of finding what they are looking for on your website. Those are the type of people you are looking for. Searchers use long tail phrases to narrow down to their specific needs, which makes their research much easier. It’s really a waste of time when visitors to your site don’t find the right information the are looking for. That can also affect your site, since the visitors will likely click away, leaving your website very quickly, which might result to an increase in bounce rate. Traffic coming from long tail keywords are most likely to stay longer on your site because you offer exactly what they are looking for. As a result of that they are more likely to perform any desired action you recommend on your site. whether it is to call, fill out a form, or buy your services or products. On Page Search Engine Optimization (SEO) is the process of optimizing your website pages in an effort to reach the top of search engine results listing. By optimizing your content or website, you can easily appeal to what the search engine crawlers are looking for. Now when that happens the search engines will push your content towards the top of their results pages, which will in turn increase your website chances of getting noticed. Optimizing your website will include things like using your target keyword in the headline, throughout your post, and in your image file names and much more. Although your website was created to cater for the needs of your targeted audience, you need to communicate your content’s topic and quality to the search engine ‘crawlers’ as well. The simple reason for that is, the first place many people go when they have a question or are looking for a product to purchase is the search engines. Now because there are too many factors that goes in to On-Page Optimization and can sometimes seem overwhelming, installing a plugin like Yoast SEO if you’re using WordPress will make things really easy for you. The Yoast Plugin will help guide you through the steps of optimizing your page . 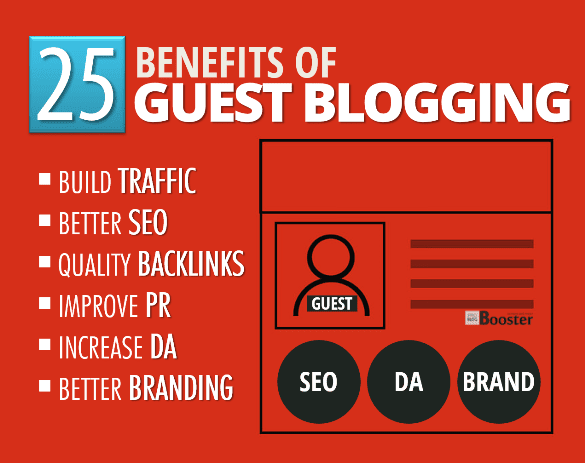 Guest blogging also known as guest posting is the ability to contribute a post to another person’s blog. Most content creators do that in order to build relationships, exposure, authority, links and ofcourse traffic back to your website. Here is how it works, you contact a particular blogger or website owner that is related to your niche and ask the to write a post on a related topic on their website. After building a relationship with the owner, and he things you can come up with a good and quality post they will give you their permission. In return, usually in the bottom of the article which is called the Author Box you can link back to your website. Many people have grown their website traffic overnight using just this strategy. ( Yeah!! that’s how powerful it is no matter what others are saying about Guest posting). With Guest posting you can enjoy traffic boost with several layers of SEO benefits with a single click. There are a lot of different ways you can go about Guest posting nowadays. As already mentioned above you can find and build relationship with related bloggers in your field and reach out to see if they’ll accept a guest post from you. This method is usually difficult because many times you will get lots of rejections, but reaching that new audience can really pay off. Making post on these types of platforms will very quickly rank high on search engines and eventually syphon some of the traffic to your site.